Smartphone power performance is getting better all the time but if you are filming or editing videos your battery can run down fast. 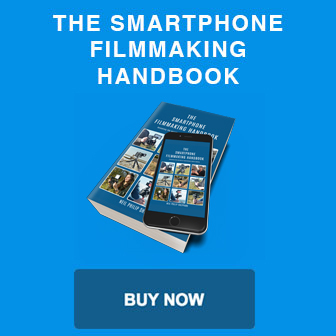 Shooting video on a Smartphone puts huge demands on the battery and can drain it rapidly. You can help to reduce this by making sure your video camera app is only on when you need to film something. 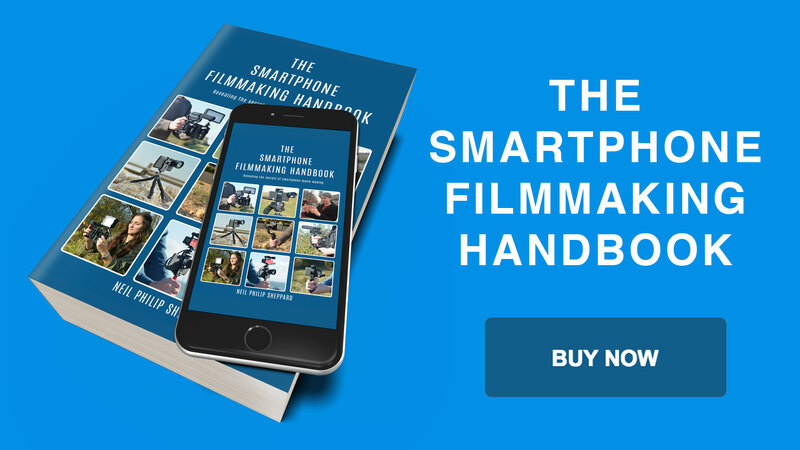 It is all too easy to put your Smartphone in your pocket and forget to turn the video camera app off. When you bring it out to use it again you will often find that your battery is almost flat. If you do find yourself at a location where your battery has run down, you are going to need a portable power bank. There are many choices to solve this problem but not all of them are good investments. The most important issue to be aware of is the mAh rating. The higher this number is the more charges you will be able to give your Smartphone. By finding out the mAh charge your Smartphone holds you can work out how many charges the power bank can give it before it needs recharging. Also, be aware that some power banks are not 100% efficient. Unless the manufacturer states otherwise you can expect to get about 70% of the advertised mAh number. Another important concern is portability. There are many different size power packs out there ranging from the small to the large. Usually the bigger the power pack the more charge it holds. The ideal power pack is one that holds plenty of charge but is small enough to carry in your pocket. 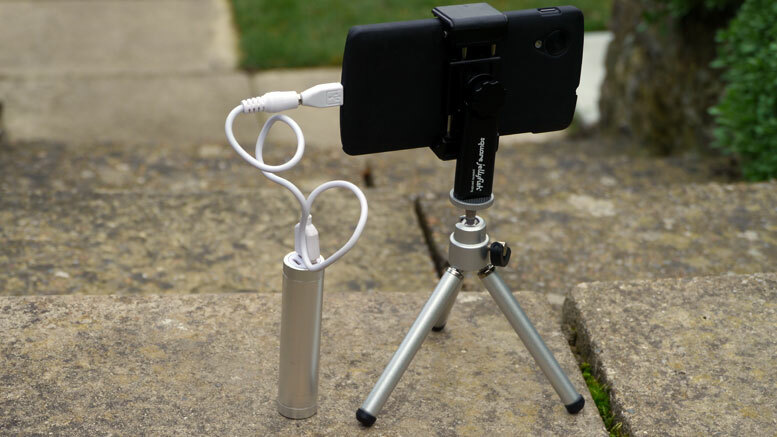 If you are filming with your Smartphone on a camera stabiliser you will want to be able to mount the power bank on it so you can plug it into your Smartphone and continue filming. If it is too large this won’t be possible. You should also be aware that not all Smartphones work well when you are using the video camera app and charging at the same time. If this is the case you should charge your Smartphone whenever you are not filming. Also, take note of the power bank’s input rating. The higher this is, the more quickly the power bank will charge from the mains power supply. This is usually a figure in Amps. Many power banks only have a 1 Amp charge where as others will have 2 Amps. A 2 Amp power bank will charger twice as fast as the 1 Amp model. Another useful extra is Pass Through charging. This means you can connect your Smartphone to the power bank and plug the power bank into the mains to charge both devices at the same time. This can be useful when you only have one power socket but need to charge both your Smartphone and power pack for the next day. The output rating of the power bank refers to how quickly it will charge your Smartphone. Again, the higher the Amp number the quicker it will charge your Smartphone. Not all Smartphones will support the faster charging that some power banks provide. Some power banks have a feature called PowerIQ. This allows the power bank to recognise the Smartphone or iPad you have connected and deliver the ideal amount of power for that device. LED lights on the power bank can also be a useful addition to warn you of how much power you have left. So the ideal power bank is high capacity and portable, has fast charging and recharging with Pass Through charging and LED power displays. You may not need all of these features but try to get a portable high capacity charger if you can. 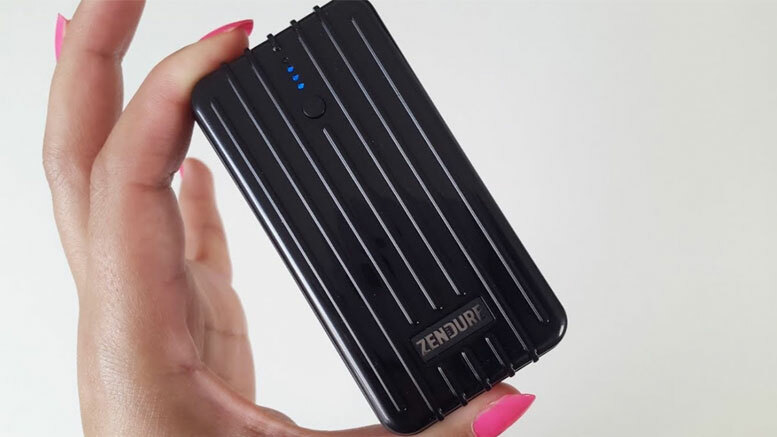 The Zendure A2 is a great all-round power bank that is a good balance between price, portability and capacity. The third-generation model has a charge capacity of 6700 mAh. It is also compact and light and Zendure claims it has an 80% efficiency rating. This will charge the average Smartphone once but usually you can expect to get at least two charges from it. It has one USB output which rates at 2.1Amps, which means double fast charging for your Smartphone. The USB input is 1.5Amps, which means it will charge in about four hours. The power bank also comes with a soft carry case so you won’t damage it when you are out and about. The build quality is good and it has a crushproof PC/ABS covering of composite material to protect it from any damage. The A2 also supports Pass Through charging which means you can charge the power bank and a Smartphone from a single power point at the same time. Other features include Auto On. This means the power bank will start charging a Smartphone as soon as it is connects to the power bank. You won’t have to fiddle with any difficult buttons or switches to start charging. There is also a button to show how much charge the power pack has and when pressed will light up the four LED lights to show the remaining power. This power bank may not have the high ratio of charge that other larger power banks have but it is portable and has many useful features not present in other chargers. 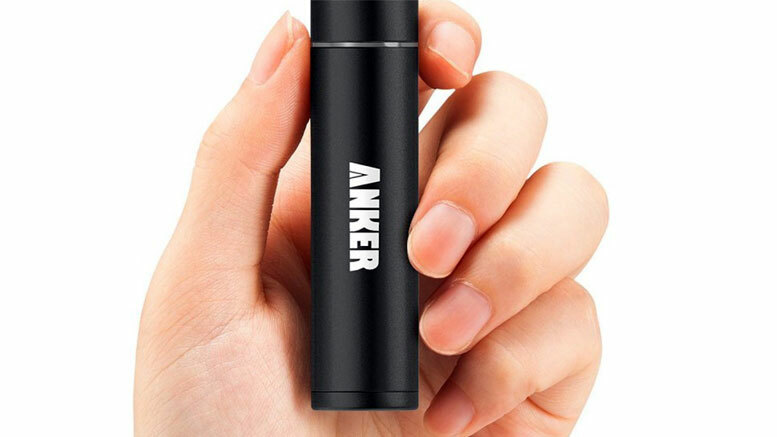 Anker’s Astro Mini power bank is a popular portable charger with consumers. It’s a best seller on Amazon and comes in colours: black, blue, pink, silver and gold. It’s cased in anodised aluminium that has a sturdy and durable feel to it. It doesn’t weigh too much either at 80g and it fits comfortably into its supplied soft carry case. The Astro Mini comes with a superb energy transfer capacity of 90% and you will find it difficult to find a similar power bank at this price with this energy efficiency. This is because of the Samsung Grade A power cells inside it. These will give more charge than similar power banks of the same power. There is no auto charge so you will have to turn it on to start charging your Smartphone. It does however have PowerIQ technology, which will identify the connected Smartphone and adapt to its recharge rate. It also has a maximum output of 1 Amp, which means it will even charge an iPad. There is no Pass Through charging and it has a low 3200 mAh power rating which may not be suitable for all. But its power cells will comfortably fully charge any Smartphone once. There is also an LED light that will flash when the power bank gets low on power. If you need a higher capacity power bank for charging then the Lumsing 10400 mAh is a good recommendation. At 159g it’s not that big and about the size of a harmonica. This may be too big for some but it will fit comfortably into any kitbag. It also comes supplied with a soft case that will protect it from most bumps and drops that may happen. It is available in black or white, with a brushed metal-effect that feels reassuringly sturdy when holding it in the hand. Inside the power bank is a Grade A Samsung power cell which rates at 10400 mAh. 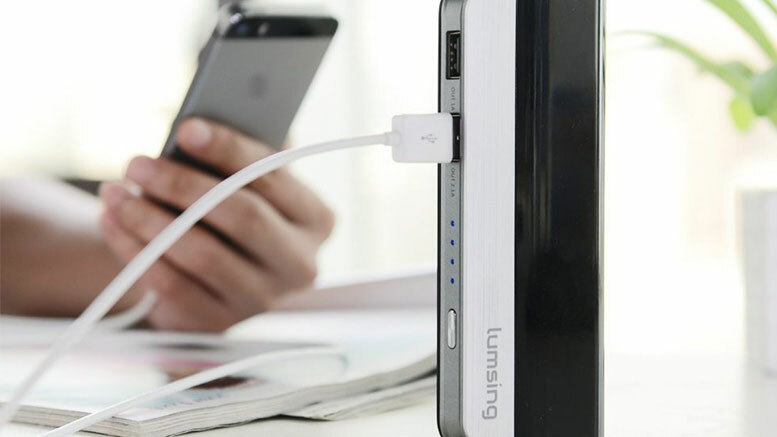 The Lumsing has two USB outputs so it can charge two devices at once. The first USB port has an output of 1 Amp and the second has an output of 2.1 Amps. So if you need to charge your Smartphone quickly you can plug it in here. The power button is also on the right of these USB ports with four blue LED lights to warn you of the remaining charge left in the power bank. This power bank does lack some features but the huge supply of charge it carries means you will not be short for power when out on location. It carries enough charge to power an iPhone three to four times, which should be plenty for a day’s filming. The Anker PowerCore 20100 features a massive charge power of 20100 mAh, which will charge the average Smartphone in about 30 minutes. It can do this with the help of QuickCharge 3.0. So if you have a Smartphone, which supports QuickCharge, you can charge it twice as fast. Some other Smartphones like iPhones don’t support QuickCharge so charging times for them may vary. There is also a USB-C version of this charger so make sure you get the right one for your Smartphone. The huge charging power means you can expect to charge your Smartphone five to six times from a single fully charged Anker PowerCore 20100. It also has two USB ports so you can charge two devices at once. 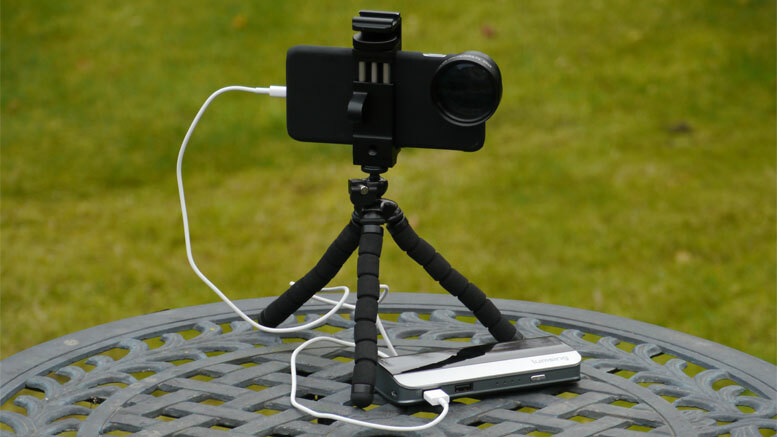 This is great if you have another device to charge like a portable light or microphone. It will take about ten hours to charge this power bank so you might want to leave it plugged into the mains power supply overnight to get the maximum amount of power. It comes in two matte colours – black and a cool looking white. There are also four blue LED lights to remind you how much charge you have left. 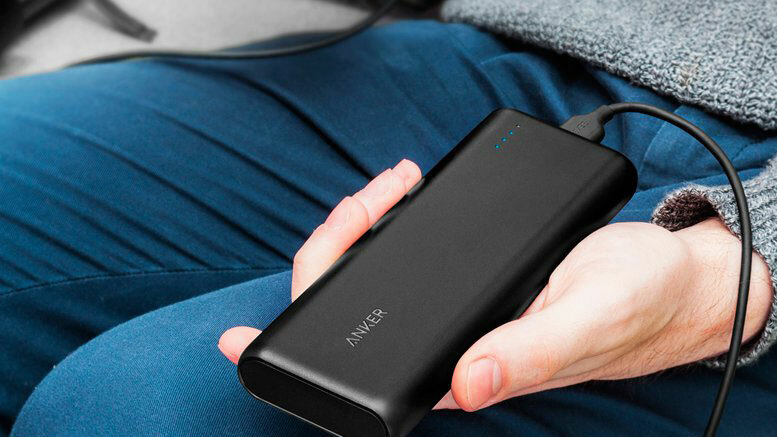 The Anker has 6 high-quality Panasonic 3400 mAh batteries inside it. These battery cells are some of the best on the market and will help to prolong the lifespan of the charger. So it should give you many years reliable service. It also has surge protection and voltage protection so it won’t damage your Smartphone if there is a power spike. 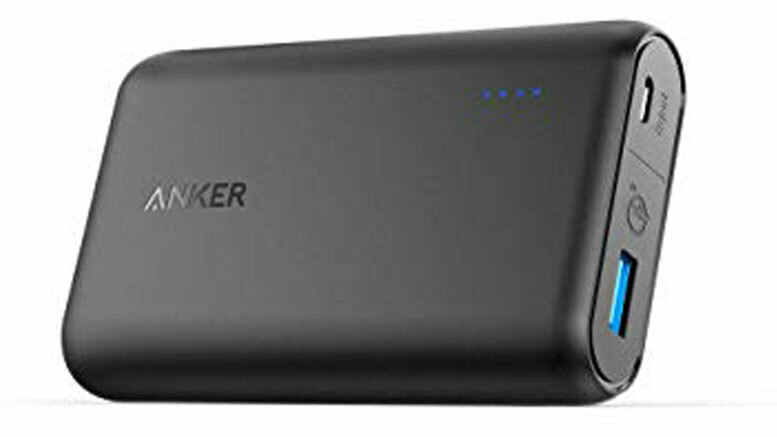 The Anker PowerCore Speed 10000 QC does not have the charge capacity of its bigger brother the Anker PowerCore QC 20100 but it is a lot smaller. The QC stands for quick charge so if you have a Smartphone that supports quick charge charging you can expect to charge your Smartphone in about 30 minutes. It also has PowerIQ so it will adapt its power output to the same as the device that it is charging. It should hold enough power to charge the average Smartphone three to four times. It looks good too with a matte black rectangular design with a tough plastic casing. The corners are also smooth and round so it will fit comfortable in your pocket without digging into your leg. It has four LED lights on the top to tell you how much power you have left and you can turn these on by pushing the button on the side. There is one single USB port to charge a connected Smartphone, or other device, and a micro USB port to connect the charger to a mains power supply. It also supports Auto On charging which means it will start to charge your Smartphone as soon as you connect it.